Now this looks promising! A great Fremantle pub reviving its brewing. Promise? It smells light and a little diffuse, with toasty grain but little else. Less promising. The palate is short, again dominated by toasty grain wih mid palate bitterness and a slightly washed out finish. As a beer this is generic, simple, mainstream stuff – a fair mimic of a James Squire Amber, but little else. What has become of this pub brewery? Digging deeper and all is not what it seems. The giveaway is on the back label: ‘Beer brewed and bottled in Australia for or under license from ALH Group Limited trading as the Sail & Anchor Brewing Co, Fremantle. 789 Heidelberg Road, Alphington Vic 3078′. In other words, this wasn’t brewed by the Sail & Anchor at all – that Alphington address is for a Dan Murphys outlet (amongst other things) and the ALH Group is Woolworths’ hotel and hospitality arm. The Sail & Anchor is owned by ALH and, given the strength of the pub brand, it’s obvious that the pub brewery has been revived as one of the Woolworths group own labels (exclusive to ALH pubs and Woolworths retail arms including Dan Murphys, BWS etc.). From the well informed William Wilson (@wilsonscec) on twitter, it seems that this beer itself is made under license by Gage Roads, a brewer who’s products, in my opinion, rarely rise above mediocrity. Ultimately this beer is clever marketing really from Woolworth’s – leverage a strong pub name with a beer focus (the Sail & Anchor once served as a Matilda Bay brewery pub) as the face of a new boutique beer label. Then have an established brewer make it and focus on marketing the stuff. what disappoints is that this is simply ordinary beer. Ordinary beer that does a good pub no favours. Again you are a fount of beer knowledge. Thank you Sir. I would say though that the Sleeping Giant IPA (while no where near on style) is a great beer and nothing close to mediocre for it's $50 a case price tag, especially compared to what else is available at that price point. It's big and malty with a nice, if not especially interesting, grapefruity bitterness. Trying to find anything else with that amount of flavour at that price is really hard going in my opinion. It's a Woolworths own brand pretending to be craft beer. We are starting to see a lot more of this practice as Woolworths tries to cash in on the expanding craft beer scene. One really does have to read the fine print on these. 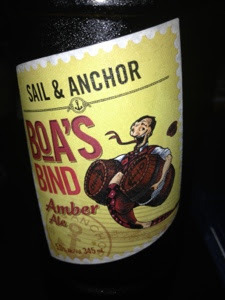 I tried another of the Sail & Anchor beers, a Kolsch I think, but it wasn't memorable enough for me to be sure it also wasn't good enough for me to bother with other beers in the range.